We are Proud to be at the DIDAC India in the UK Pavilion with Caroline Wright of BESA and Delhi's Minister Mr Manish Sisodia. Good lad Ryan! To be fair, you certainly have them interested! Well done boys! Proud of you! 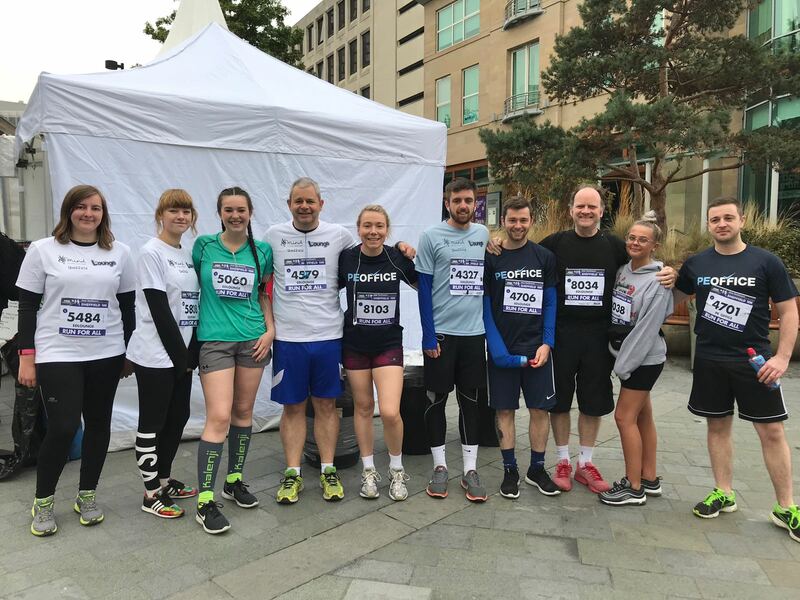 This weekend we teamed up with PE Office and took part in the Sheffield 10k to raise money for Mind, the mental health charity. It was a challenge but everyone had a great time and have raised £800 in support of those with mental health problems. We have launched EDLounge with our first student in the UAE! We're looking forward to developing more in the future and helping students in the UAE to fulfill their maximum potential. We are proud to be 1 out of 32 providers nationally who can deliver this! Stepping stones back to mental health, breaking barriers to learning across all health issues, chronic fatigue, short term and long term health issues. Looking to accommodate and find solutions for every school. Is a learning platform to help your students improve their outcomes through a personalised e-learning pathway Today, EDLounge has over 8,000 lessons in core, foundation, vocational, and academic subjects. The most comprehensive School Improvement Management Platform and Learning Environment. EDSimple will stream line your whole school practices. It has been exstensively added to by a few key Senior Leaders that have designed the system so that it is now a Whole School Management and Learning Solution for SLT and staff. It constantly evolves. We now can offer courses, advice and assistance for a range of traineeships, apprenticeships and adult learner as EDLounge is proudly now an approved training provider. All our qualifications match the skills, behaviours, standards and framework for each framework. We can now offer tutoring, teaching and delivery for any academic subject required for any learner that is disengaged and disadvantaged. We can now offer our services to all students, teachers, admin and schools throughout the world especially those following the UK Curriculum and qualifications through our adaptable portal that has been customised and created by a few partner schools internationally. In 2014, we launched our remote learning and online support / supervision platform known as EDClass so that we can cater for all your students, teaching assistants, senior leadership and parents’ needs. Within this support and supervision mechanism we offer tutoring, assessment, pre-assessment, verification, and expertise in any subject for any age group. We offer support and supervision to any individual that is on the system, whether they are on-site or off site and undertaking theory, practical, knowledge or academic lessons. All our support officers are uniquely trained to have a wealth of knowledge and understanding of the EDLounge system, including lessons, qualifications, methodology, exams, coursework, and practical elements, enabling the student to continually learn and progress. Our expert support officers have an extensive knowledge of the qualifications we offer and put into place an exclusive pre-assessment, assessment and feedback service for the students alongside safe supervision. To help with the qualifications, a range of practice, live and mock exams are available for the students to prepare themselves for their BTEC and GCSE courses. We cater for every aspect of the next generation BTEC courses and we offer a comprehensive support mechanism for the students undertaking these. Our support and supervision officers support students in exclusion, home education, isolation or in inclusion, whether they are on or off-site with a thorough and robust safeguarded provision which addresses government legislation for alternative provisions on/off-site for academies. Students are able to ask and receive help, feedback, comments and direction from our support officers so that all students can progress through EDLounge. In 2014, We started to work overseas with partners in The Philippines and Australia. In 2013, we were granted to offer Functional Skills in English and Maths where we have hundreds of lessons and practice exams for your learners. In 2012, EDLounge was granted to be a registered centre and have worked with EDEXCEL, NOCN, City and Guilds, AQA, and NCFE examining bodies to become an approved and verified centre (no: 67674) for some academic and vocational subjects. EDLounge was created in 2009 as an inclusive resource to educate students that were in inclusion and exclusion, with an aim to develop their knowledge in Maths, English and Science. EDLounge now delivers a high quality provision to students who are: home educated, part of the travelling community, vulnerable, at risk, foundational learners, disengaged, demotivated, or have low level literacy or numeracy.